It occurred to me recently that there may be some people who do not know how awesome the Serializer is. This is unacceptable. The Serializer WL is the newest robot control board from Robotics Connection, and it’s a nice all-in-one solution for anybody looking to dive into the sometimes intimidating realm of hobby robotics. There they are. The DB-9 serial connector comes with the Serializer. A USB module is available for those of you with new-fangled laptops, or if you just like the convenience and versatility of USB. Best of all, two wireless options are available (Bluetooth and Zigbee), so you can finally make that un-tethered PC-controlled robot you’ve always wanted. In addition to all of the great hardware features, the Serializer also has a very nice .NET API for all of you higher-level programmers out there. The Serializer also works with Microsoft Robotics studio, if that’s your thing! 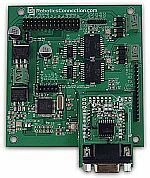 For more details, check out our Serializer WL product page.